After a couple of days without a shower you tend to feel pretty happy when you eventually get one. Namche was a place for shower among other niceties so well rested and full of expectations I was ready to get into something wilder than the overpopulated Everest trail I had seen so far. 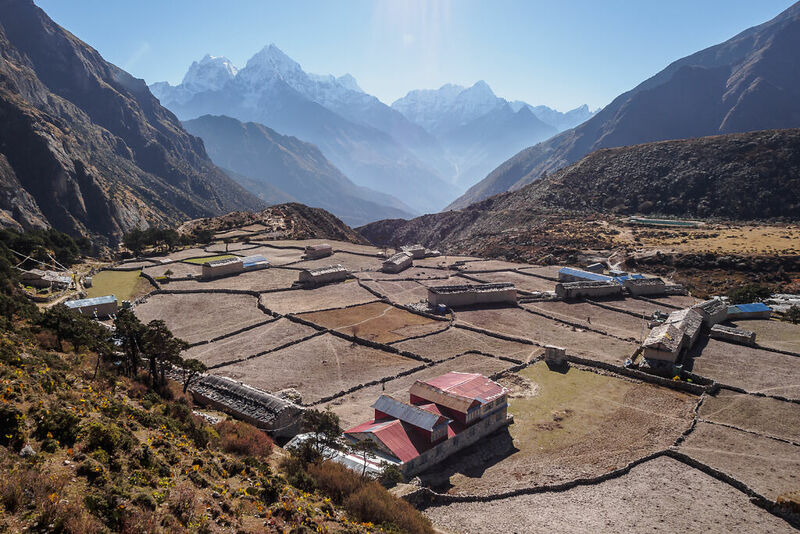 Most people continue north-east from Namche either to the Everest Base Camp or to Gokyo. 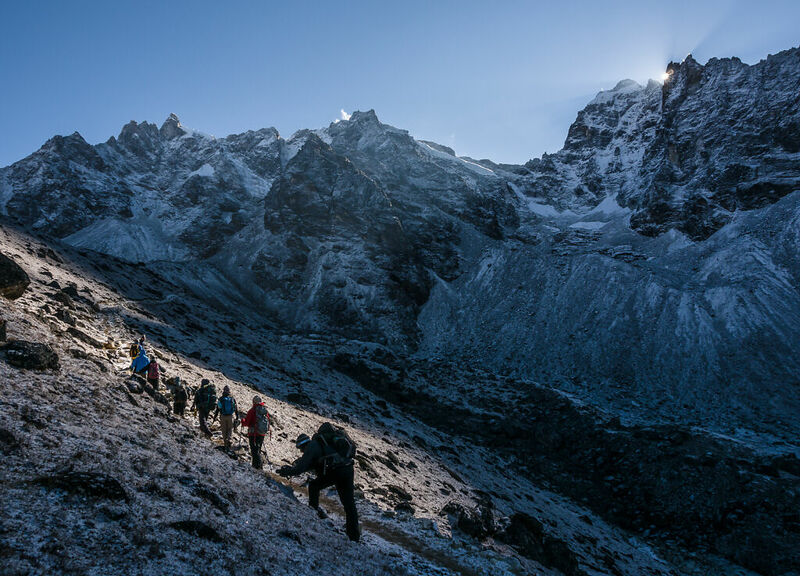 Our group's goal however was to take an alternate route to Gokyo that was longer and more challenging. 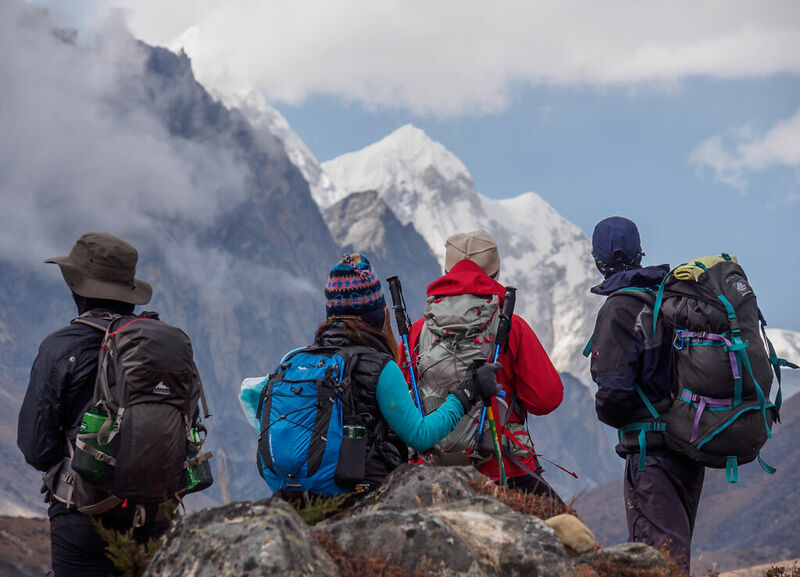 It involved trekking up the less-known Thame Valley that would take us very close to the border with Tibet and finally descent into the Gokyo Valley through the high Renjo La pass (5400 m / 17716 ft). Thame Valley historically has been part of the so called "salt route" from Tibet. Tibetan traders would carry goods on their backs crossing the icy Nangpa La pass (5806 m / 19049 ft) to Nepal and walk a couple of days to Namche Bazaar to sell them on the market. The Chinese government tightened the border control in the area and I was told that Tibetans don't come any more to Namche this way for the last couple of years. Looking back east from Thame Valley. Thamserku and Kusum Kanguru are on the horizon. Thame is the largest village in the valley and it is better known as the home of Tenzing Norgay - the first Sherpa to climb Mount Everest together with Sir Edmund Hillary in 1953. Apa Sherpa - the man who holds the record for climbing Mount Everest the most times (21) was also born here. 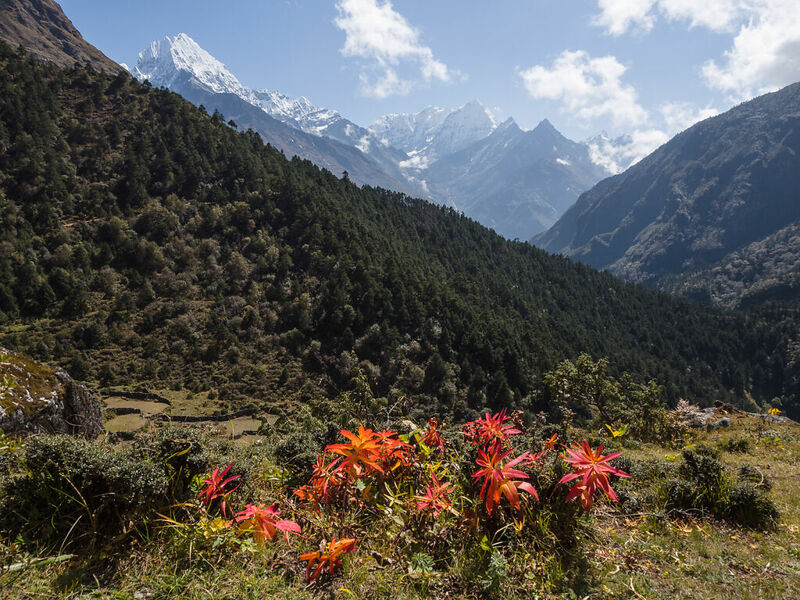 The trail from Namche to Thame follows the Bhote Kosi river and passes through several quiet villages along the way. The walk is easy and usually takes half a day to reach Thame, that's why sometimes trekkers do it as an acclimatization day trip from Namche. We however took our time and used most of the day to stop and enjoy the superb views in all directions. Finally we arrived at Thame later in the afternoon but I knew the day wasn't over yet as I had read before that the Thame gompa - a 350-years-old monastery - was a site worth seeing. And worth seeing it was! I ran up the short trail to the monastery and my enthusiasm got most of the others from the group to follow. Perched on a steep mountain side and surrounded by rocky cliffs and icy peaks partly hidden by the scattered clouds the monastery had an air of ancient mysticism - as if it had come out of a fairy tale. Our arrival coincided with the start of the evening service at the temple so Karma (our guide) took us in and we witnessed a real Tibetan Buddhist ceremony. We even got blessed by a supposedly reincarnate monk! On the next morning we started north to Lungden. The way from Thame to Gokyo is too long to take within a day so trekkers usually stay at Lungden before they climb Renjo La pass. We turned a corner and entered a different world: barren dry land, distant rocky peaks and scattered stone houses and walls that could've been built last year or two hundred years ago but I wouldn't know the difference. The only animate parts of this otherwise still landscape were the Bhote Kosi River (that translates as Tibetan River) and an occasional yak grazing the scarce yellow grass of the valley. A rest stop high in Thame Valley. Looking north at some 6000 m mountains close to the border with Tibet. The walk to Lungden was easy and with a gentle angle as we had to gain only about 400 m / 1300 ft before we reached it. The highlight for the day was the lunch break we took at Marlung - one of the larger villages in Thame Valley. I was able to sneak into the kitchen and made some photographs of how our food got prepared. The small space of the kitchen was bustling with action as our hostess together with her two children and our two sherpas got busy peeling potatoes, carrying water, pumping kerosene in one stove and making sure the other stove did not run out of dung. Wood is simply not available at high altitudes so Sherpas use dried yak dung to make fire for cooking and warmth. At 4380 m / 14370 ft Lungden is a natural place to stop and rest before attempting the 5400 m / 17717 ft high Renjo La pass. It is merely a group of several lodges, not really a village. The trail branches off after Lungden. One continues north and follows the Thame Valley to Nangpa La pass on the border with Tibet. I could see the trail following the turns of the Bhote Kosi River as higher and higher icy mountains stood on both sides of the valley. The sense of touching something mystical from the previous day resurfaced again when I remembered that foreigners were not allowed to travel on that trail. 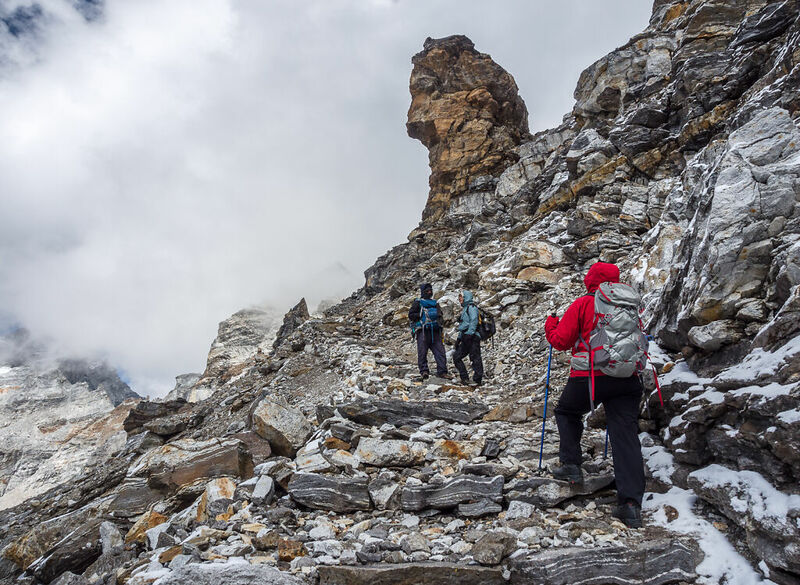 The other branch of the trail turns right and climbs the eastern slopes of Thame Valley to finally reach Renjo La and cross over to Gokyo Valley. That was our route for the next day. I enjoyed Renjo La very much! 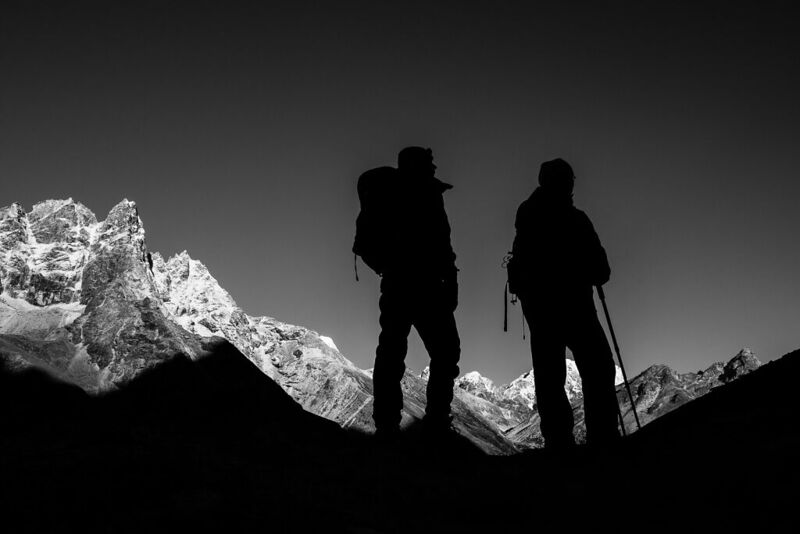 Going to high altitudes, walking among some of the biggest mountains in the world, crossing from one valley to another and completely changing the landscape within minutes, physically challenging myself and finally seeing great panoramic views of the Everest range - I had come to Nepal for all this so I was really looking forward to that day. You have to gain 1000 m / 3300 ft from Lungden to Renjo La and then descent another 700 m / 2300 ft to Gokyo. At the top of the pass the inhaled oxygen is only 50% of that at sea level so good acclimatization is very important for safely making it to Gokyo. We were looking at a full day of walking so we got up very early in the morning. It was still dark and quite chilly when we started up on the trail to the pass. Most of the ascent is actually very easy. The trail is well-beaten and goes at an easy to moderate angle. The fun part begins after reaching Renjo Tsho (lake). Then it turns right and starts climbing much steeper until it reaches Relama Tsho - the lake just below the pass. Then follows the steepest part of the trail - the last vertical 400 m / 1300 ft are gained through a maze of moraine and loose rubble. I learned with a surprise that the local people actually built stairs among the rocky chaos that is the west side of Renjo La. Big (and I cannot imagine how heavy) slabs of rock were put together to form a quite decent staircase that made the final part of the climb fairly easy. The last few minutes before Renjo La (pass). We are almost at 5400 m.
I was screaming for one whole minute when I finally got to the top and saw Mount Everest impossibly big and dominating the entire landscape on the other side. The village of Gokyo on the shore of Gokyo 3rd lake - Dudh Pokhari - stood below. Behind it lay Ngozumpa glacier - the longest in Nepal (36 km / 22 mi). Above it was an endless chain of rugged snowy mountains - some of the tallest in the world: Cho Oyu, Gyachung Kang, Everest, Lhotse and then further east hidden in the clouds must have been Makalu. It was past noon though and the clouds quickly thickened so I had only limited time to photograph all that. One of the best views in Nepal Himalaya - a look east from Renjo La. Mt. Everest, Nuptse and Lhotse are above the clouds. Cholatse is to the right. in the clouds. 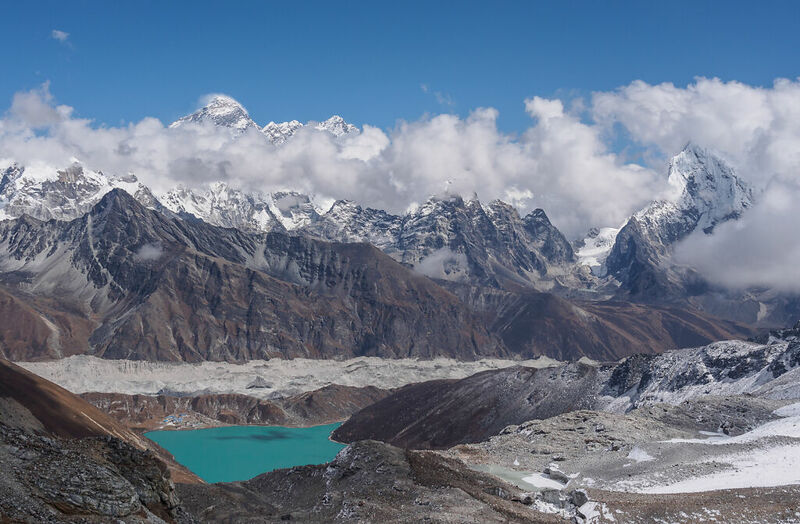 Below is Gokyo Valley with Dudh Pokhari lake, Gokyo Village and Ngozumpa glacier. Pictures from this part of the trek can be found in the Thame Valley and Renjo La album.